There are many tasty goodies on the market for your dog but are they needed and are they any good for your dog? These hard dog chews come in all shapes and sizes and can be found in every shop that stocks pet products. Unfortunately they are not good for our dogs as they can harm them in many ways. 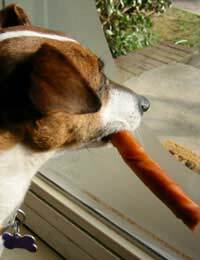 The dog does not always digest the chew and chunks can perforate the intestines and death will follow. Sometimes the dog will not eat the whole chew and it will become soft and pliable, left lying about for days it will attract bacteria and cause upset an upset stomach when the dog returns to it. Chocolate is poisonous to dogs and will kill! It may be tempting to share our own chocolate with our dog, especially when he looks so appealingly at you and gives you his paw. But don't do it. A dog's digestive system cannot process chocolate and enough of it will kill him. Have you seen those brightly coloured dog chews? Slightly pliable they are consumed quickly and with gusto by our pet. However the colours do as much damage to a dog as they do to our children. Full of additives and E numbers they are not good for out hairy chums. Extra sweets and treats will soon see your dog heavier than he should be. Not only is this not good for his heart and lungs but can put a strain on his joints, which will affect his mobility and shorten his life. Give your dog only his daily quota of dog food and avoid all treats until he is back to his original size. After this watch his weight carefully as yo yo dieting is as bad for him as it is for us. Vegetables are not only good for us but are excellent for our canine friends as well. Replacing fattening treats with a fresh carrot will help keep his teeth clean and his waistline trim. If your dog needs to lose weight a handy tip is to replace some of his mixer biscuit with finely chopped vegetables. A selection of carrot, cabbage, turnip, spinach and other root vegetables plus garlic can be shredded in a food processor and mixed in with his meat. A clove or two of garlic is also beneficial. Never give a dog onion or potato. Set oven to gas mark 220. Mix dry ingredients together. Mix eggs together and stir in adding enough water to make a pliable dough. Place on floured board and roll out to approximately half an inch thick. Use a biscuit cutter or a knife to cut into reasonable sized pieces - depending on the size of your dog. Place on a greased tray in the centre of the oven and bake for 30 minutes or until the biscuits are hard and crunchy. You can add any tasty ingredient to these biscuits including pureed liver.